Water filtration systems are used to remove impurities from your water supply to the best of its abilities. It may involve a physical barrier and possibly a chemical process to rid any elements that may affect the quality of your water. One of the most important things that must be achieved is to ensure that the water is safe for consumption and use when coming into contact with one’s skin. 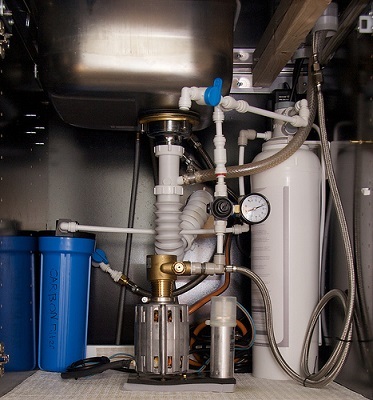 Read on to find out more information about these water filtration systems! The system uses a type of filter media to intercept the flow of water. This filter media stops potential contaminants from crossing over by physically blocking it, allows chemicals to adsorb, or a combination of the aforementioned processes. All types of filter work almost the same way – it traps microscopic bacteria such as Cryptosporidium and Giardiasis, preventing you from ingesting it. The filter system utilizes an intake hose to draw water from the source and into its filter membranes. However, these bacteria are not killed, just trapped with the other debris, and it is enough to allow clean water to pass through its filter outlets. Once it is out of the aforementioned system, it is up to the user on how the clean water should be utilized. The filtration process could start from the well water pump, making sure everything is cleaned before it is dispensed for your usage. The filters may eventually clog, and usually you will notice that it gets increasingly harder for it to pump new water into it. Never force water through the pumps under this circumstance. Instead, adhere to your manufacturer’s instructions for best results. Well, you should have already acquired a basic understanding about the system and now you should know the most common reasons on why it should be used! Toxic materials that are found in drinking water are linked to several types of cancer. Ensure that none of these materials enter your water source, that’s intended for personal consumption. EPA has shown reports that lead contents that are found in drinking water contributes significantly to more than 450,000 cases of dyslectic children annually in the US alone. Even developed countries can be affected by epidemic diseases through water contamination. Pregnant women should never drink water that potentially contains lead, not even the slightest bit! Instead, pure drinking water supply should be made available to them. Untreated tap water may contain over 2,000 forms of contaminants. Ingesting it brings about detrimental effects to one’s health, especially if it is consumed on a regular basis. Hire a professional to do a thorough water test and see if he or she gives you the all clear, that the water is safe for consumption. Every effort that’s put into your vigilance goes a long way for your loved ones and yourself.